Mishto Doi means meethi dahi or sweetened yogurt and is a famous Bengali delicacy. Once you taste a good Mishti Doi you will forget any frozen yogurt or ice cream, this is such a rich and creamy caramel flavoured yogurt. We actually tasted Mishti Doi for the first time when my younger sister got married (this was a month before my own wedding) in a Calcutta based family and her mother in law sent a huge handi of Mishti Doi to our home as it is considered auspicious. We licked the handi clean within a matter of minutes once it was opened and tasted. Later I asked a few Bengali friends from Calcutta an they would say Bengali shops in Calcutta use a lot of additives to make this special yogurt rich and creamy. Apparently few of them add trans fats and even corn starch to make the yogurt well set and rich in taste. I happened to taste the bad, the good and one of the best Mishti Doi in Calcutta later, we even tasted Mishti Doi and other sweets from Bankura as a Mishtiwala used to ferry these to our Dhanbad campus. The traditional way of making Mishti Doi is simpler but time consuming and the cost of making it becomes higher for commercial establishments. Full fat milk is reduced till the milk sugars (Lactose) caramelizes and the reduced milk starts looking brownish and gets thick. Then sugar is added and the milk is cooled down to lukewarm temperature, yogurt starter is added and the Mishto Doi is kept to set in earthen pots. Once set, it can easily be scooped out just like ice cream. The total fat content of the reduced milk also becomes quite high and that helps the yogurt to set beautifully and smoothly. 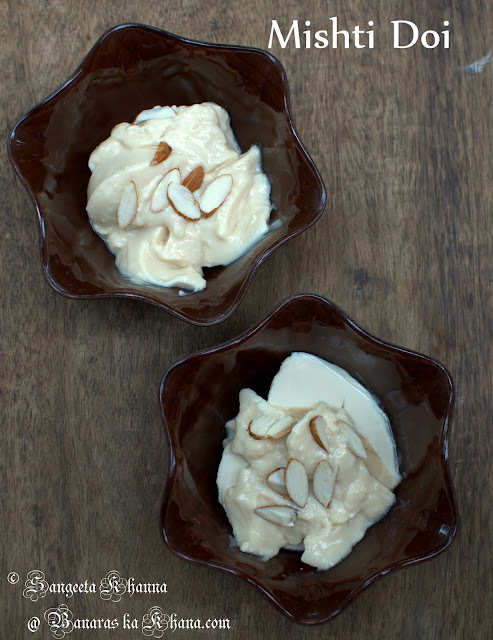 If you make this Mishti Doi at home you can control the fat content if you wish. You know I am a homemade freak and made this many times to recreate the taste of the best Mishti Doi I had back then. I succeeded and found that it was always better at home. The fresh ingredients, no added fat or color and sweetness just as much you want. Initially I used to make this using condensed milk as the perfect dark color of Mishti Doi came from it but then it used to get too sweet. Later I tried reducing the milk at home and found the best results. Whenever I forget the milk on the gas stove for a couple of hours (Yes it happens when I am busy with something or a phone call comes and I forget) and the milk reduces and becomes brownish, I don't feel bad as Mishti Doi is just a few hours away. If using the first set of ingredients for milk version reduce the milk so much that it becomes 700 ml. Cool down till lukewarm to touch. Caramelize the sugar (if using) in a shallow pan by heating it with a tbsp of water while rotating the pan gently over high heat. The sugar melts and then starts browning, wait till it becomes like honey and then pour into the cooling reduced milk. If using palm sugar no need to caramelise, add the sugar and whisk to dissolve. Once the milk is lukewarm, add the yogurt starter and whisk nicely till the mixture froths. Cover and keep in a warm place till set. If making the condensed milk version, just heat the milk, mix with condensed milk and wait till the mix becomes lukewarm. Ad the yogurt, whisk well and keep in a warm place to set. Serve chilled with chopped nuts as a topping . This Mishti Doi keeps well in the fridge for a week if you make larger quantities though it is difficult to save it for that long..
Haven't eaten mishti doi in a while.. have to try it soon. Wow this must have tasted delicious! Hmm reduced milk with yogurt culture...ohh heavenly! Seems to be a nice item as the sweet course of a meal ie dessert too? Isn't it ? wow what a lovely dish...I love authentic dishes and you say you make banaras food..yummy!...will check out the rest! Wow, sounds easy enough. Is misthi doi the same as rabdi in Hindi? We make it in the north by reducing milk by boiling it and then adding sugar to it. What do u mean by Yoghurt culture here...do u mean home-made dahi ? Hi Anonymous...sugar should be added as per taste . We like it lightly sweetened so 2 tsp per cup of the reduced milk is good enough. some people like it sweeter so more sugar can be added , at the same time it should be taken into account that too much sugar will make the texture of the doi syrupy . Take care.